How to move Parallels Desktop to a new Mac? I need to transfer an existing virtual machine to your new Mac. When you buy a new Mac, you do not have to install your virtual machine once again - you can just transfer an existing one. Important: Shutdown your virtual machine before following the steps below. Locate the virtual machine on your old Mac hard drive. 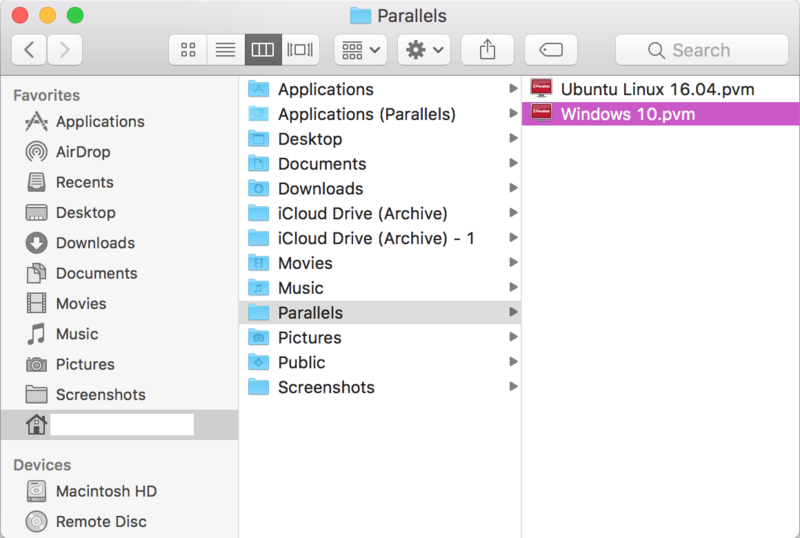 By default, virtual machine files are located either in Documents/Parallels folder inside your user folder, or in /Users/Shared/Parallels. Copy the .pvm file to an external hard drive or transfer it via network. Connect your external hard drive to the destination Mac. Copy .pvm file from the external Hard Drive to any folder on the destination Mac. You can disconnect the external device now that your virtual machine has been successfully moved to your Mac. Install Parallels Desktop, then double-click on the .pvm file on your Mac to start the virtual machine. Note: OS X does not support writing to NTFS partitions by default. We recommend to format your external drive to either OS X native HFS+ file system or ExFAT file system (for compatibility with Windows PCs). Note: FAT32 file system does not support files bigger than 4 GB.